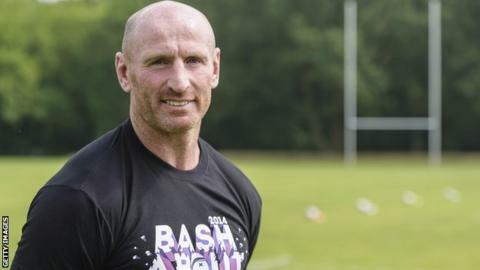 Former Wales captain Gareth Thomas says he would not have played in France if it had stopped him playing for Wales. On 28 August the Welsh Rugby Union and regions announced that no player based overseas can represent Wales. National coach Warren Gatland is able to make exceptions, but Thomas said the rule would have stopped his move to Toulouse in 2004. "I wouldn't have sacrificed playing for Wales to play for a team in France," Thomas said on BBC Scrum V Extra Time. "But I understand if people do." The so-called Gatland's law is part of a £60m deal between the WRU and the four Welsh regions which ended nearly two years of dispute in Wales. The agreement also introduces dual contracts for limited number of key players which will see the WRU pay for part of their contracts. Players currently based outside Wales will be exempt from the new selection rule while their contracts run. However, it is aimed at discouraging players from following the likes of Jamie Roberts (Racing Metro), Leigh Halfpenny (Toulon) and Jonathan Davies (Clermont Auvergne). "If I'd been told before I went to Toulouse 'if you go you won't play for Wales' then I wouldn't have gone to Toulouse," added Thomas, the first player to win 100 caps for Wales. "Financially Toulouse was a big pull [but] I would have turned it down. "It's very difficult, I'd have had to look at my family situation and a lot of other scenarios. "You just can't judge a rugby player on 80 minutes of rugby because a rugby player is a lifestyle - and I have gone to clubs because financially they benefitted me. "Financially I was rewarded for playing for Wales as well, so I made up for it in other ways, but I wouldn't have sacrificed playing for Wales." Thomas, who captained the British and Irish Lions in 2005 in New Zealand when injury ended Brian O'Driscoll's tour, also fears there will not be enough money to bring players already in England and France back to Wales when their current contracts end. He cited Northampton's Wales and Lions wing star George North as an example. "If George North wants to come back to Wales because of a family situation and all the money is used up, is he going to come back for 60 per cent less wages than [Cardiff Blues and Wales wing Alex] Cuthbert for instance?" asked Thomas.